Since 1885, Geiler Plumbing, Heating and Air has provided expert furnace repair, sales and service to keep families in Cincinnati, Northern Kentucky and Southeastern Indiana warm all winter long. With our unpredictable winter weather, it is very important to maintain your heating system, the last thing that you want to deal with is a faulty heating system. It is important to have your furnace inspected and serviced before the cold sets in. Our low-cost maintenance agreements will help keep your heating and air conditioning equipment operating efficiently at peak performance, helping to prevent major breakdowns before they occur, and maximizing its life expectancy. As an added bonus, you also enjoy priority service and discounts on services. Click here more information. At Geiler Heating and Cooling we service and repair all makes and models of heating systems including oil furnaces, gas furnaces and boilers for residential and commercial.. Our factory trained technicians will expertly diagnose, repair and service your furnace or HVAC to restore maximum efficiency and comfort. Our trucks are fully stocked for equipment repairs and all our technicians are professionally factory-trained, nationally certified and state licensed. For example a furnace rated at 80 AFUE means for every dollar you spend to heat your home, 80 cents is returned in heat and 20 cents is lost. The AFUE rating does not include how much heat energy is lost through the ductwork of the heating system. Leaking ducts or duct work running through a cold attic will increase how much is lost. A 80 AFUE rated furnace compared to older furnaces which recover only 45-65 cents worth of heat, these 80 AFUE furnaces are affordable and good choices for your home. To get the maximum worth out of each dollar spent on gas, a 90% plus operating furnace is the best option available. Each dollar spent in turn can bring up to 98.2 cents back in heat to your home. At Geiler Heating and Cooling we offer furnace systems from 80 AFUE to 98.2 AFUE to help fit your budget and comfort and to lower your monthly heating bills. Please give us a call today to find out more or to schedule your free in-home consultation on a new high efficiency furnace or central air system. 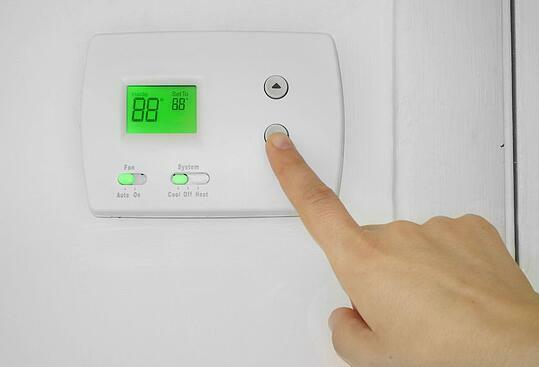 With our wide range of dependable programmable thermostats, non-programmable thermostats and zoning thermostats you have total control over temperature, humidity, air treatment and timing including Wi-Fi remote capability. Our thermostat gives you total control with its remote access and with cloud connectivity you can access it anywhere using your smartphone, tablet or laptop. The iComfort can send you or us alerts when your system needs service. Call us today for more information. This week-end, my heater blower went out on my old furnace. I called Geiler at 10:00 pm Friday evening. Dennis answered & said he could come as soon as he drove from Batavia to Cheviot. He was here by 11:00 pm. After looking at my furnace & trying to get model numbers etc. , he said he would try to find the correct parts. Saturday morning he called & said he had a new motor for me !!! Amen. He came & with a lot of work, got it installed and running. What a blessing. Dennis was friendly, efficient, capable & showed he really cared about getting the job done for me & took pride in his work. In today's world of lackluster workers, Dennis made a miserable experience very refreshing. If I ever need more heating or plumbing repairs I will definitely call Geiler. Thank you.